Detour notice: As of Sept. 5, 2017, a 3.5-mile section between Woodmont Avenue in Bethesda and Talbot Avenue in Silver Spring at the northeastern tip of the Capital Crescent Trail (also known as the Georgetown Branch Trail) will be closed for an estimated four to five years due to the construction of Metrorail's Purple Line. An on-road detour has been designated around the closure; a map of the route is available on the website for the Purple Line Project Team. 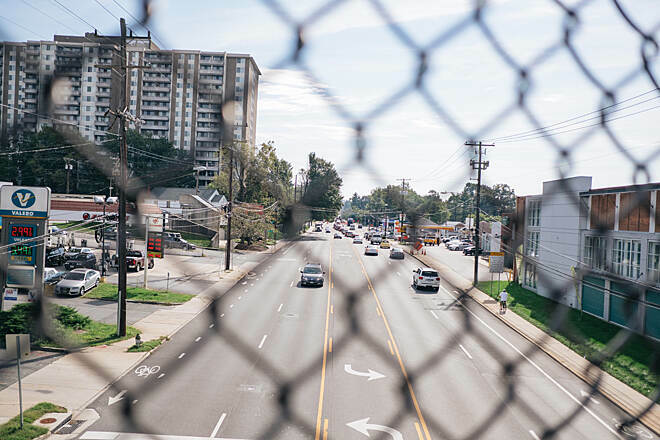 As the route involves riding on busy Jones Bridge Road, which doesn't have a shoulder or marked bike lane, less confident riders can find low-stress alternatives to the official detour on the Washington Area Bicyclist Association website. 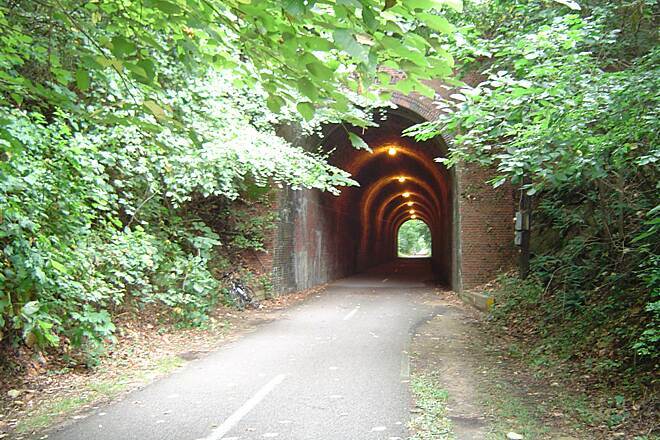 The 11-mile Capital Crescent Trail follows the route of the Georgetown Branch rail line of the Baltimore & Ohio Railroad. 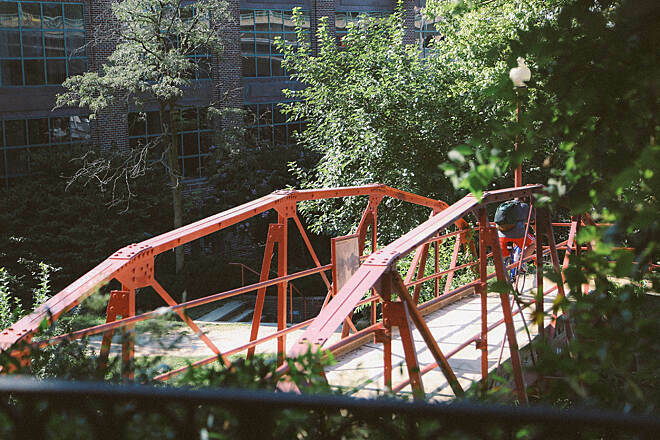 It begins in Silver Spring, Maryland, east of the Rock Creek Trestle and curves westward and south through Maryland into Washington, D.C., to end in the heart of historic Georgetown. 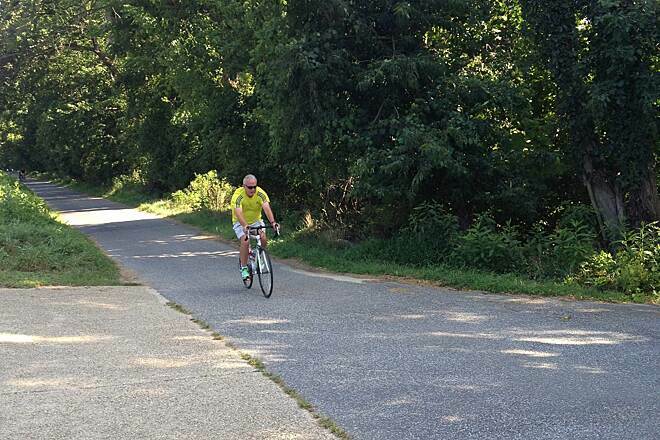 For the 7 miles between Georgetown and Bethesda, the trail is paved. 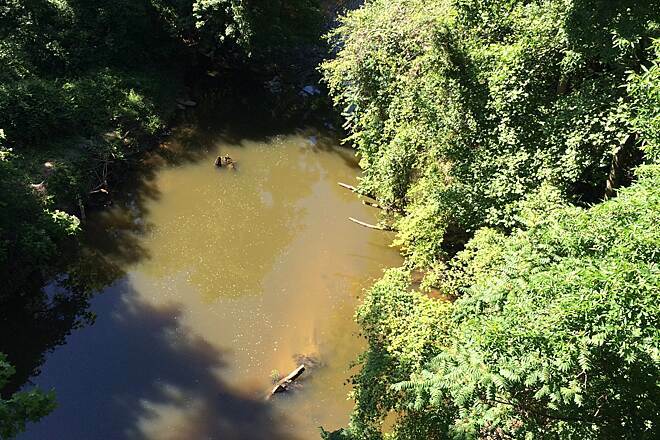 Between Bethesda and Silver Spring, a 4-mile section is surfaced with crushed stone; this segment is called the Georgetown Branch Trail. 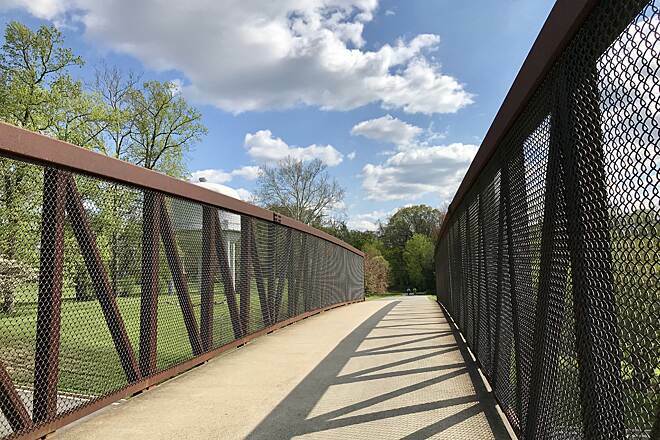 Future plans call for creating a hard surface alongside the proposed Purple Line light rail between Bethesda and downtown Silver Spring, where the Capital Crescent will connect to the Metropolitan Branch Trail. 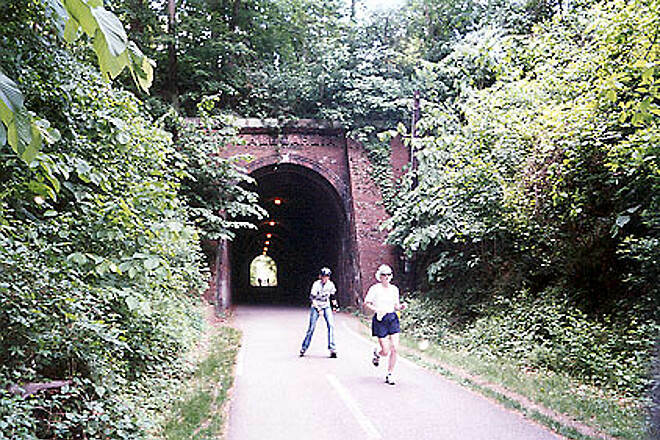 The asphalt section of the trail connects Georgetown to Bethesda. 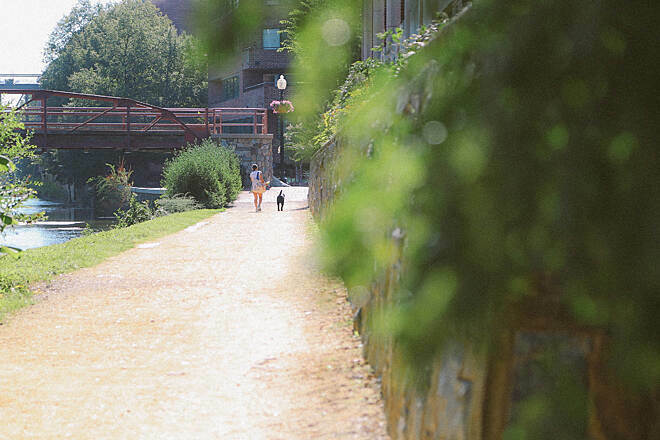 In Georgetown, the trail travels with the Potomac River on one side and the Chesapeake & Ohio Canal National Historical Park towpath on the other side. From the trail, you can watch the rowing crews of Georgetown University at practice or possibly jog past a senator. Deer, foxes, rabbits, many species of birds and the three different color phases of ubiquitous local squirrels—white, grey and black—also share the trail. 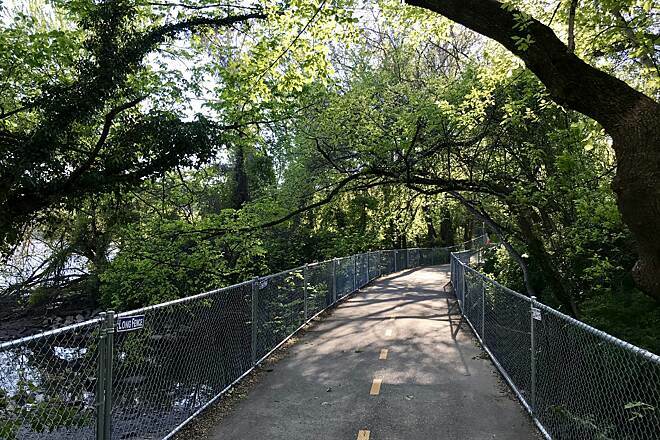 In Georgetown near Thompsons Boat Center and in west Silver Spring at Jones Mill Road, the trail connects to Rock Creek Park, a densely forested area that closes its roads to car traffic on weekends and becomes a playground for non-motorized uses. 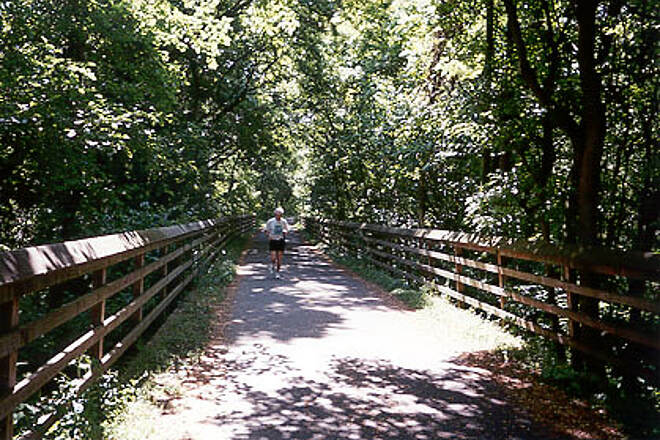 The park's popular Rock Creek Trail and Rock Creek Park Trails provide everyday access to the park. 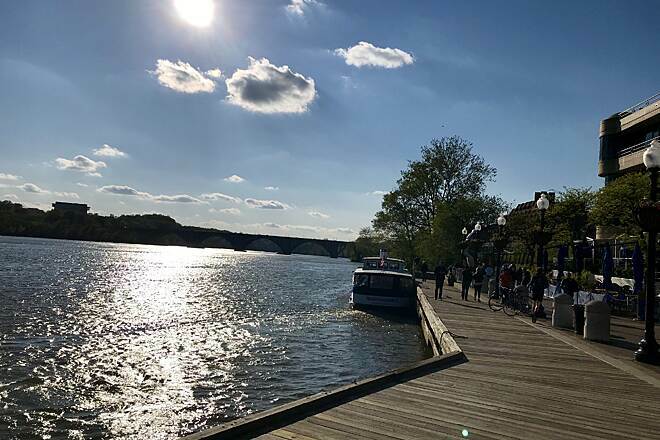 The loop of the Capital Crescent Trail and Rock Creek Park totals 22 miles and takes you past the National Zoological Park and the Kennedy Center. 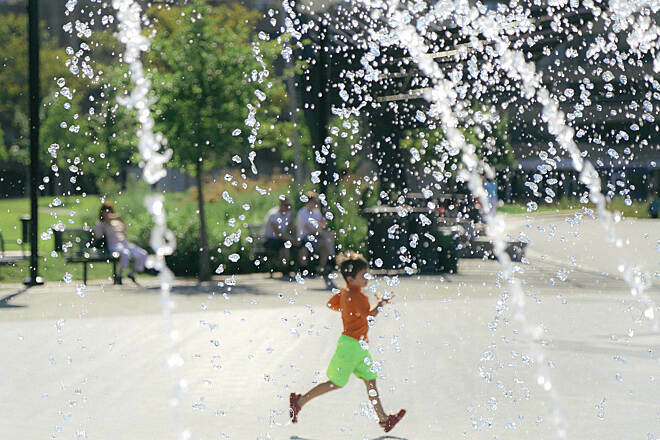 In Silver Spring, Bethesda and Georgetown, there are a number of places immediately off the trail to have a meal or a cup of coffee, as well as a large number of retail shops. To start in Bethesda, take the Capital Beltway to the MD Route 355 (Wisconsin Ave.) exit and head south toward Bethesda. In downtown Bethesda, turn right onto Bethesda Ave. 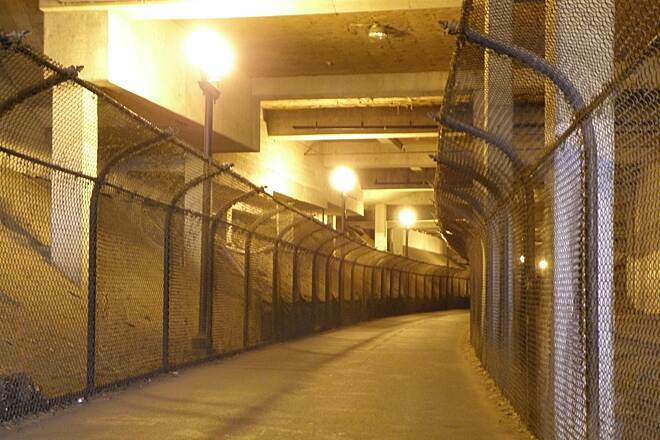 The trail crosses Bethesda Ave. at Woodmont Ave., just one block west of Wisconsin Ave.
To begin in the Georgetown neighborhood of Washington, D.C., go south on Wisconsin Ave. to its end under the Whitehurst Freeway and turn right onto Water Street. 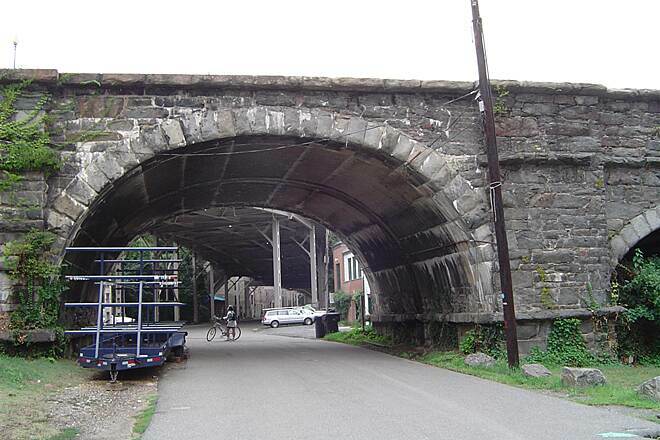 The trail begins at the end of Water Street. Street parking is usually available along Water Street on weekends. 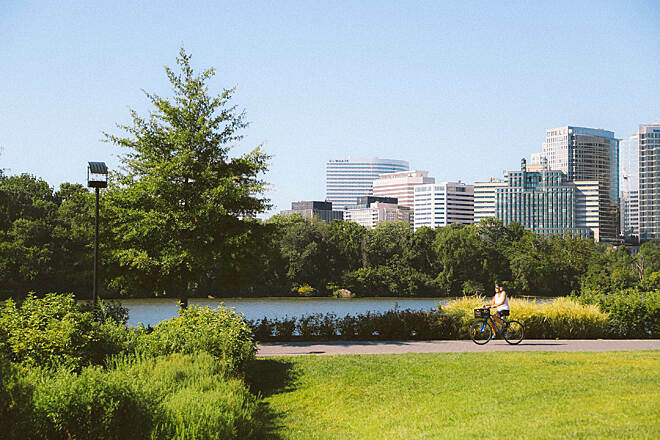 To access the on-road bike route that connects downtown Silver Spring to the Georgetown Branch, from the Capital Beltway (Interstate 495), take the Georgia Ave. exit south toward Silver Spring. After 1.5 miles, turn right on Colesville Road in downtown Silver Spring toward the Metro station. At the first light, turn right onto Second Ave. 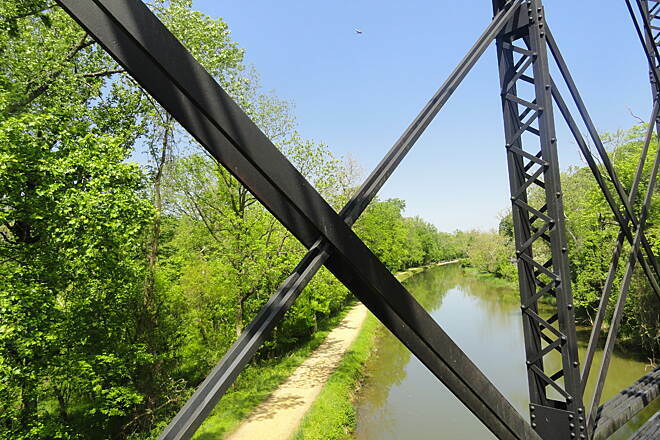 The Georgetown Branch Trail starts at this intersection. The section between Bethesda and Silver Spring is closed until 2022 while the add a heavy rail transit. Takes you away from the city life around and suburbia. What a wonderful escape. 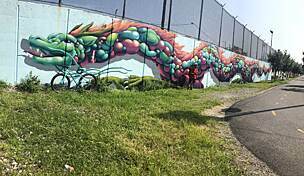 Although now threatened to become the Purple line for the metro. 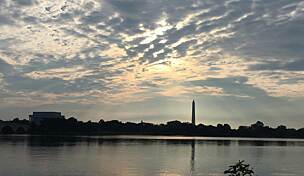 Today I took the Capital Crescent Trail for a planned 8 mile run. 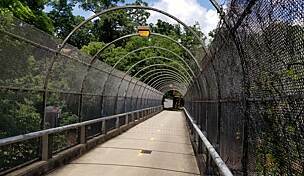 I started from the Bike Trail at the Washington Harbour building and ran through the Dalecarlia Tunnel and back (9.2 miles). 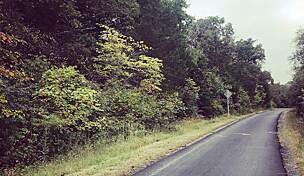 From the 9.0 mile marker forward, it is a steady uphill, and back to Georgetown it's all downhill. 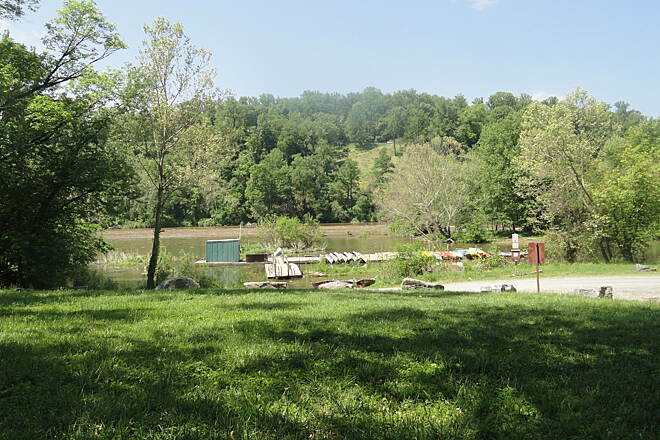 Right now the area just after Jack's Boats/Potomac Boat Club has some construction, but there is enough room where runners and bikers can get onto the main course. I did find at least one established restroom (Fletcher's Boathouse), so it's okay if you have to make a pit stop while you run. There are some deer along the path, but IMHO, just give them a glance and leave them be. The area is wooded with parts of the course by waterways, so make sure you apply your trusted insect repellent and wear headgear when you go out. I started my run around 6:00 am, and the area got substantially populated about 7:30-7:45: remember to use common sense/common courtesy/situational awareness. I didn't run the entire course, but what I did see was well maintained, with clear course markings (w/mile markers) and restroom access and opportunities. There are dirt trails along the path, but make sure you consult the map so if you take them, you don't stray too far. This was a worthwhile course for running on a Sunday morning! My nephew was playing in a soccer tournament in Potomac so we looked for a trail in the area and found the Capital Crescent. 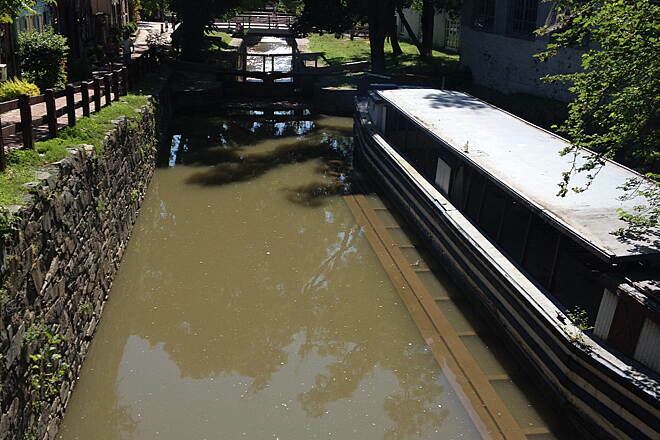 We started in downtown Georgetown along the old C&O locks. Diverted over Key Bridge for breakfast the returned to the trail for a fantastic round-trip ride all the way to the end in Chevy Chase and back. 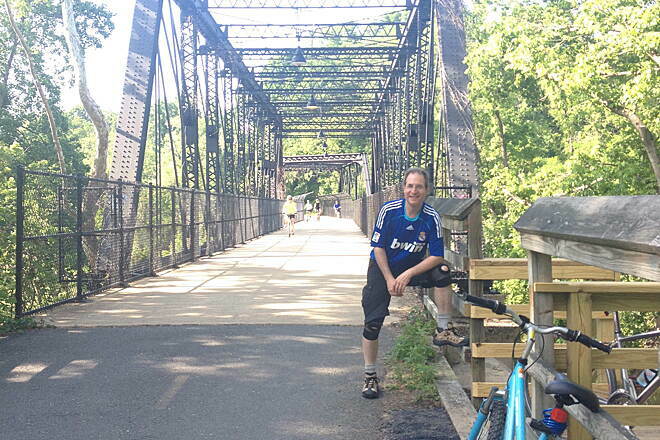 Train trestle, canal, Potomac River, other streams all made for a very scenic trip. Stopped on the way back and checked into our Bethesda hotel. 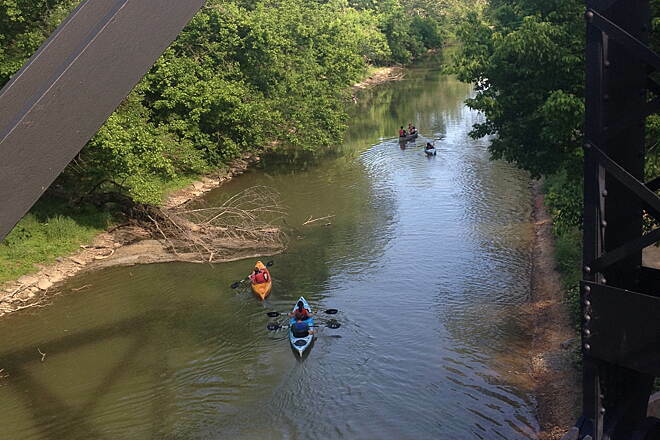 We want to return now and go kayaking along the canal and standup paddle boarding long the Potomac. A must ride trail!! 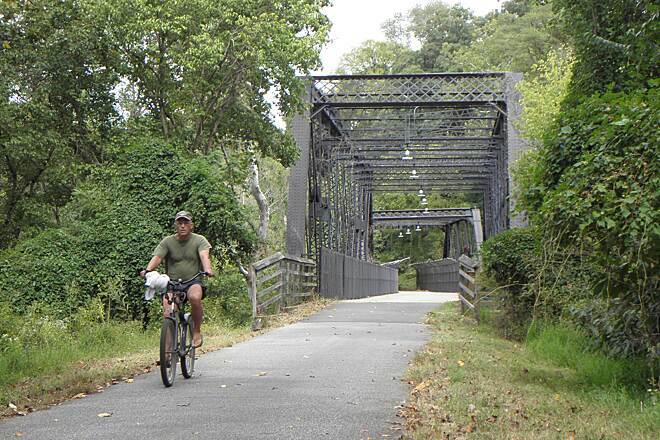 Rode this trail last week from Bethesda to Georgetown. The trail is paved and where it is not it is smooth riding. 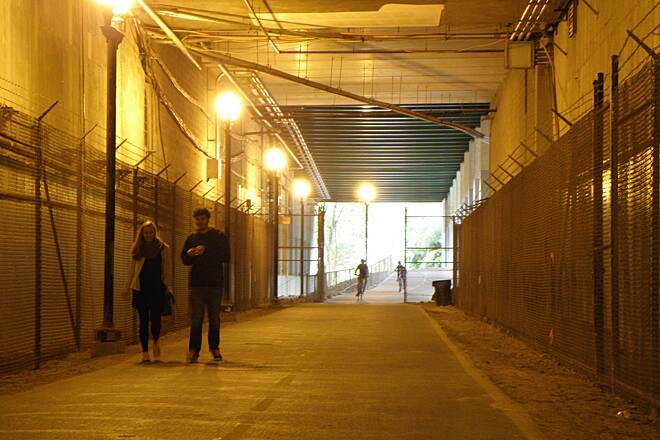 A commuter path for the locals; as many riders/runners access the trail to run or bike to work. Heavy traffic at times but was well spaced apart. 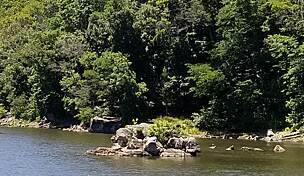 The trail is well marked and offers great views of the Potomac River. 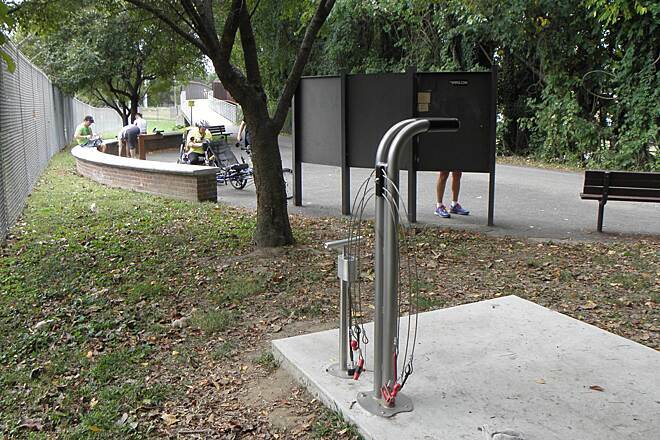 The trail has many access points through the neighborhoods it travels through. Most are a stair climb though. 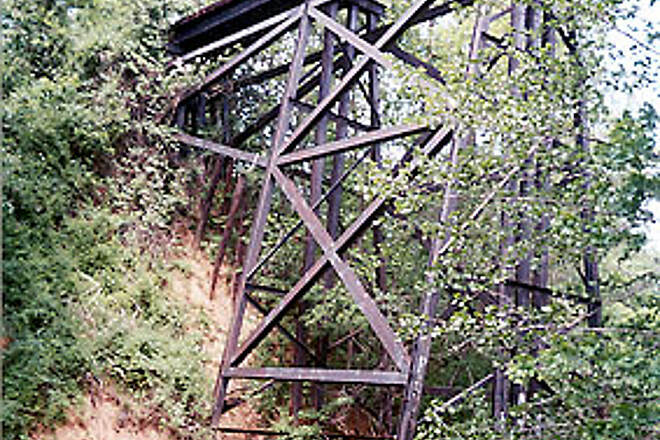 The trail ends at the Keys Bridge. 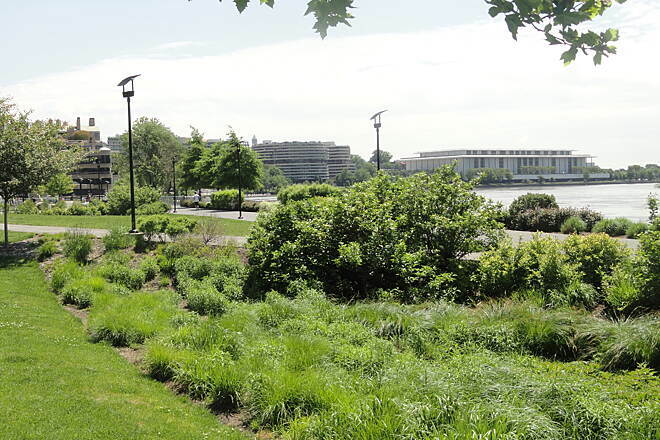 If you keep veering to the right after the Keys Bridge you will reach the Washington Monument, The Capitol and other American historic buildings. 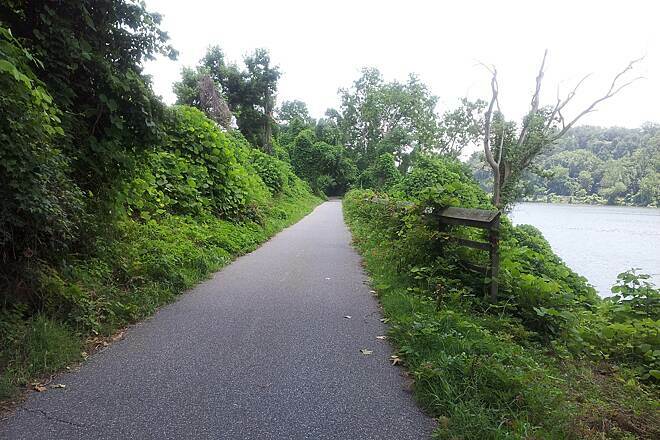 We had a great time on this trail as it was part of our journey from the GAP trail. 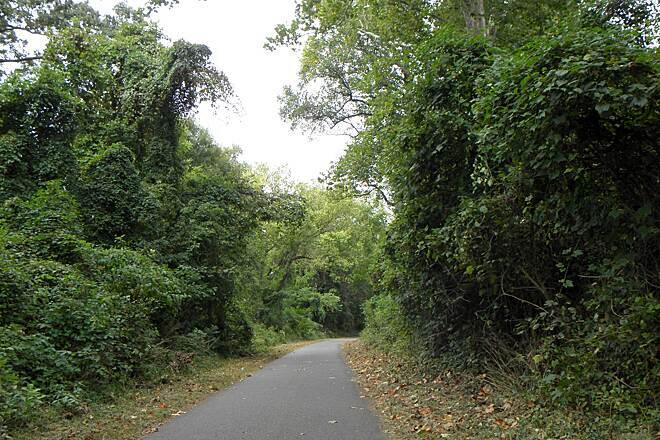 Well maintained, paved heavily wooded trek through Northwest DC area. You have no idea you are in the middle of a major urban area. 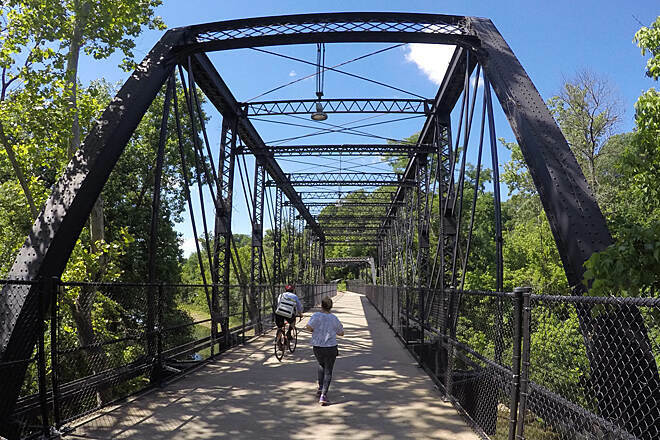 Connects with C&O towpath trail, Rock Creek trail and DC Riverwalk paths and trail. 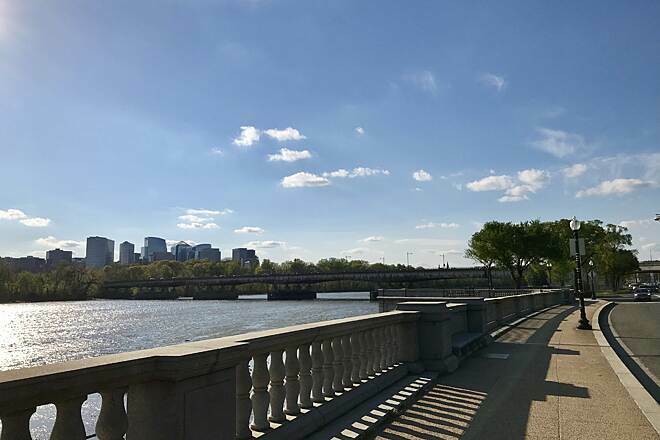 I started my Capital Crescent Trail (CCT) journey at the synagogue parking area at Rock Creek Park and followed the Capital Crescent Trail to its end in Georgetown and then meandered my way past the Kennedy Center, Tidal Basin, and onto Hain’s Point across the Potomac from National Airport. This added roughly 10 more miles round trip and is definitely worth it. 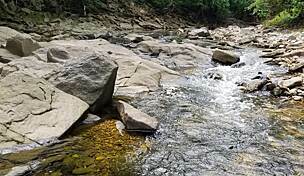 (30 or so miles total round trip from Rock Creek Park/Silver Spring) The CCT is well marked (once you have found it), pretty flat trail with nice scenery. You can get something to eat in Bethesda or Georgetown if you want stop. 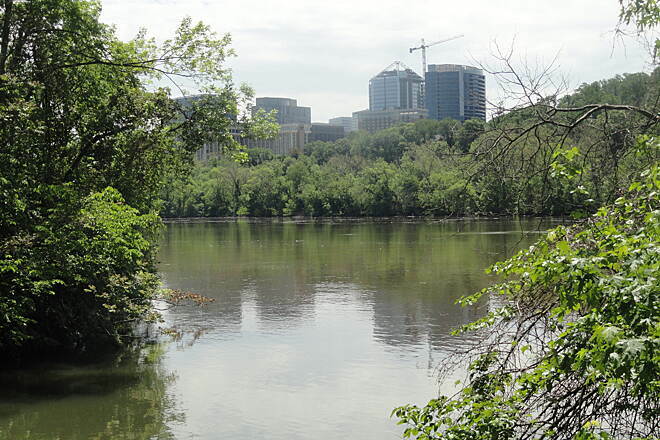 The CCT has river, canal, Kennedy Center/Watergate, and Arlington views. 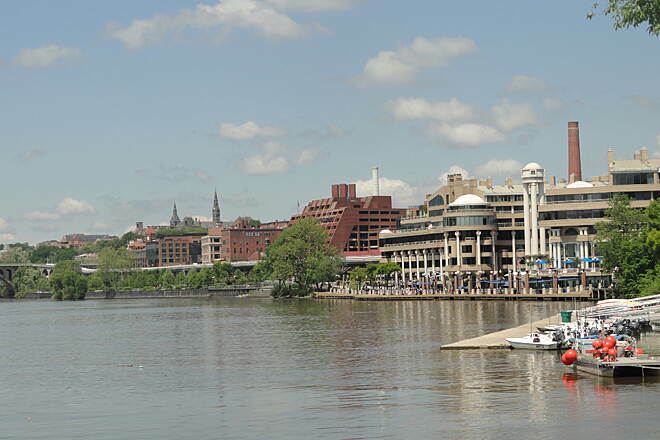 The CCT could be improved if it formally continued to the Tidal Basin and onto Hains point. TB and HP are scenic places to bicycle, but would be better if there was a formal well marked trail network that extended from the CCT. 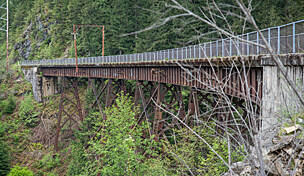 I did this nice trail a week ago Sunday and had a very nice ride on my old Mt Bike with a Town and Country tire. Like the review by tinawink said the signage in Silver Springs is not the best. On the up side of Silver Springs, on Sundays there is lots of free parking but the rest of the week I am not sure. I did the trail from end to end and had a great ride. I would suggest that on a weekend I would make sure I had a mirror as the road bikers haul the mail and just fly by you. Because of my drive down from Delaware I jumped into Rock Creek Park and did another 10 miles. It is hard to believe that you are in the middle of a highly populated area as you ride on theses trails. There are a couple of street crossings that are a little tough if you are in a group or with a family. There is a nice canopy most of the way. 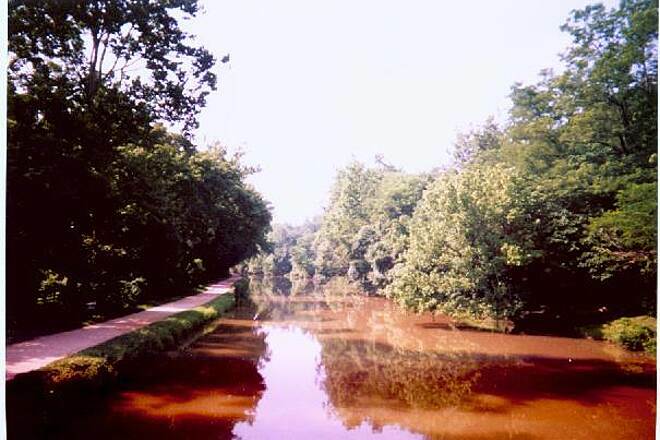 If you live in the Baltimore or Washington area you need to put this trail on your bucket list. 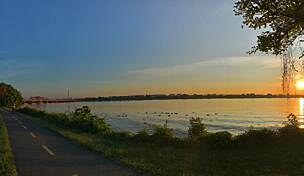 I would make sure I did the southern end as it ends at Washington Harbour, with a great view of the Potomac River. Very difficult to find the trail in Silver Spring - without asking someone else passing by on a bike, we never would have found it. 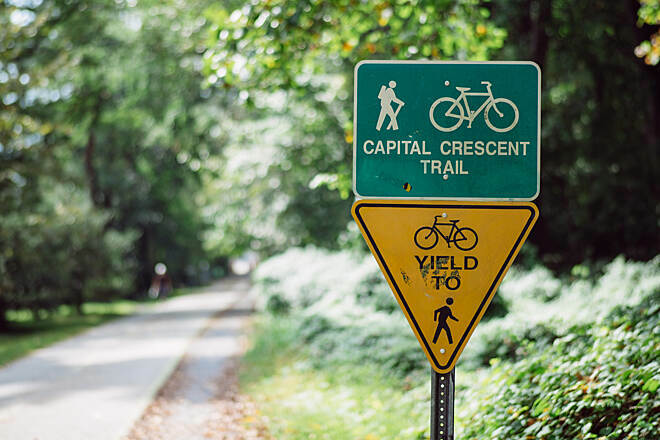 Also, a lot of the signs say "Future Capital Crescent Trail" - no idea what that means. The trail starts in Silver Spring with a couple of miles of crushed gravel - not ideal for a road bike, although it worked. I was nervous, so we ended up switching to the Rock Creek Trail Park from here. It was easy to get on it (again, thanks to the help of other riders) but we had a hard time remembering how to get back to Capital Crescent when we were done (again, poor signage). On the positive notes, pretty scenery for most of what we rode on this trail. There are a number of free parking spaces at the Bethesda pool. 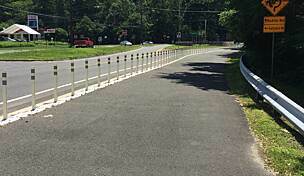 This is at the intersection of Little Falls Parkway and Hillandale Road. During hours when the pool is in use in the summer, it might be hard to get a space. 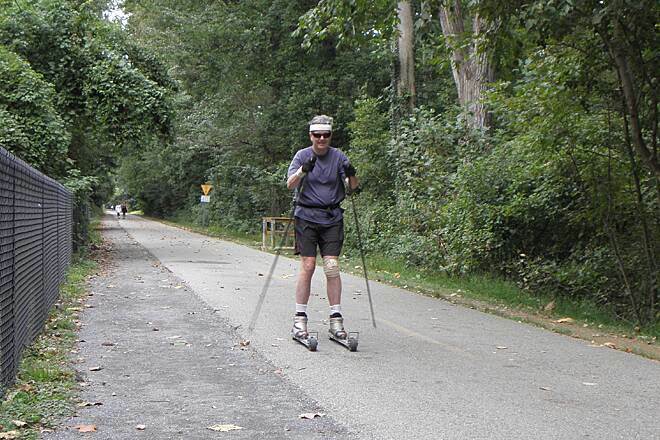 I commute on the trail from Chevy Chase to Silver Spring. I can't think of a more pleasant way to go to work as the trail is peaceful and wooded. 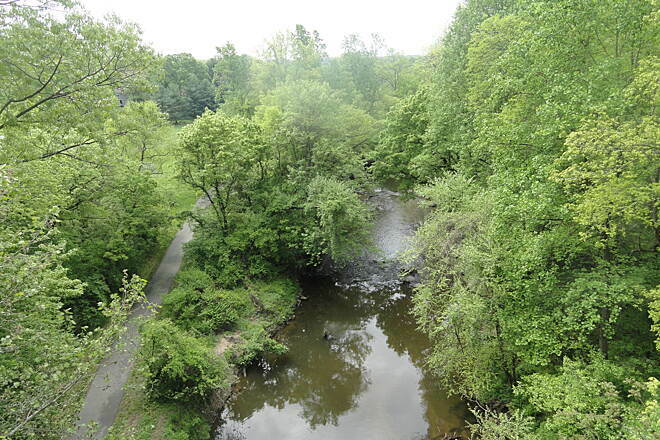 It goes through the Columbia Country Club and Rock Creek Park. 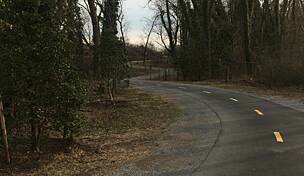 The trail is packed gravel from Bethesda to Silver Spring but is still pretty smooth for the most part. 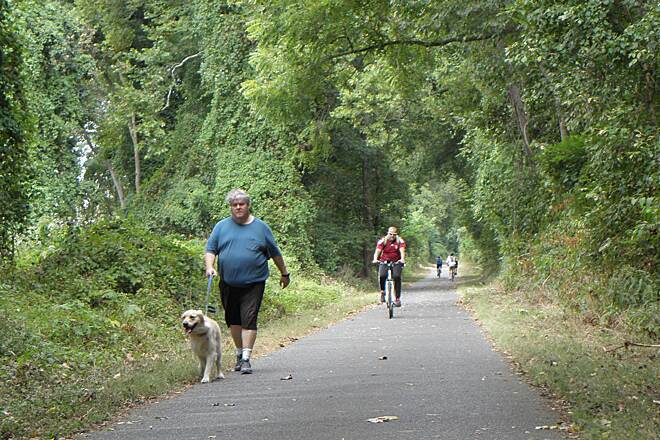 This section of the trail sees much less use than the section from Bethesda to Georgetown. From Bethesda to Georgetown the trail is tarmac and continuous. So following it is easy. 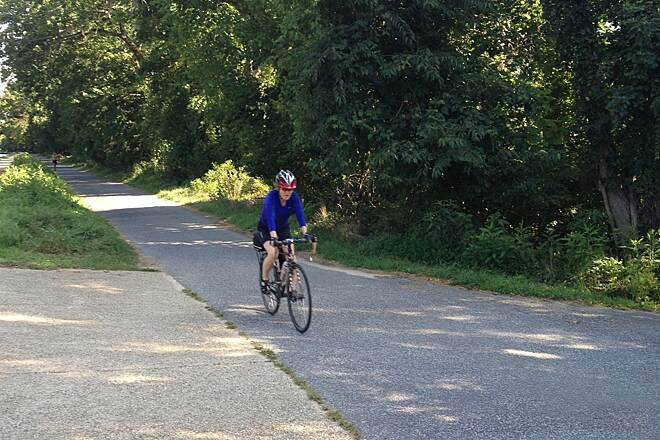 The trail from Bethesda to Georgetown is a gradual downhill so it is much easier going that way than coming back. This section gets pretty crowded on weekends in the Spring, Summer, and Fall. 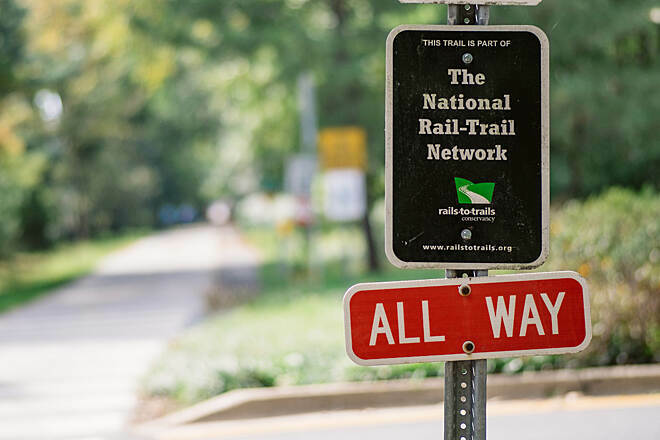 When heading from Bethesda to Silver Spring, the trail will stop at Connecticut Avenue. You'll have to cross the street at the light and then look to the left of the large office building to pick up the trail again. 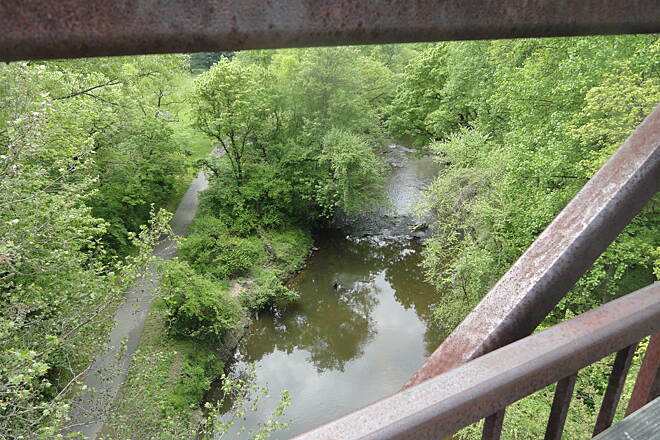 When the trail ends in Silver Spring, it is in a light industrial area and you have to wind your way through a quiet residential neighborhood to get into downtown Silver Spring. So when the trail ends, it can be tricky to find your way to downtown Silver Spring thus you really have to study a map in advance and/or carefully look for small green trail signs. Going from Silver Spring to the start of the trail is fairly difficult your first time as it is easy to miss a turn and the entrance to the trail is tiny and not so clearly marked. The 'busiest" road you'll have to bike on is Second Avenue, and that is a wide slow residential road that doesn't usually have much traffic on it. I've never had a problem with cars on it. Second Avenue in and out of downtown Silver Spring is a bit hilly but not too steep. 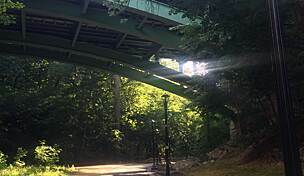 An option is to get off the Crescent Trail at Jones Mill Road (just a little past Connecticut Avenue when heading East) and onto the Rock Creek Park trail or take Jones Mill Road south where it becomes Beach Drive through Rock Creek Park. Much of Beach Drive is closed to cars on weekends and this is also a great place to ride. 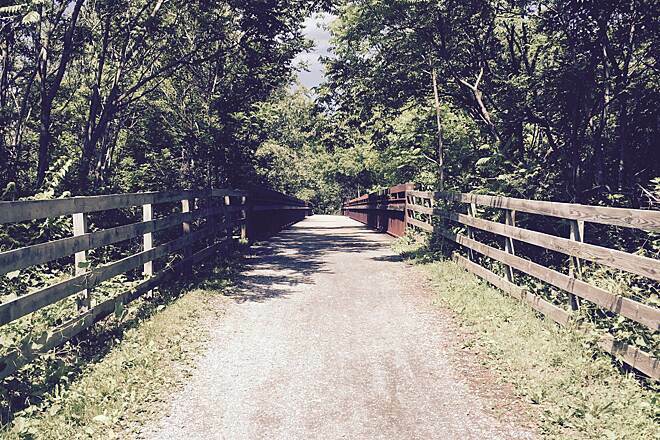 "This was a nice trail to ride. 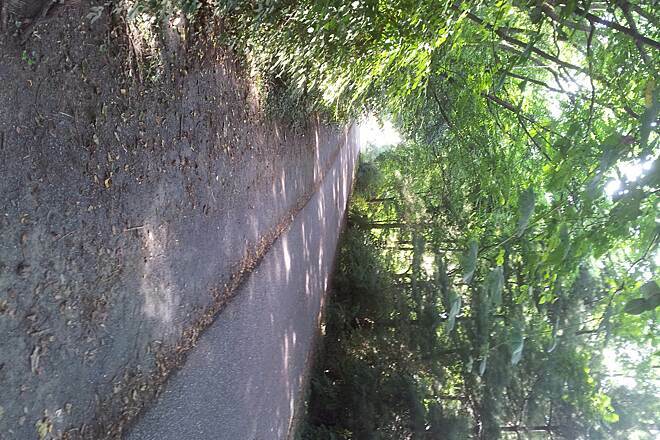 I was surprised at the tranquility of the trail, given the location within a higly populated metropolitan area. Parking could be an issue, espescially if you plan to ride on a week day. We parked in muli-level parking garage (lot #57) in Bethel Maryland @ $0.50 per hour for long term parking (3 hours or more). The parking is free on weekends and should be more available as you aren't competing with the office workers for spaces." 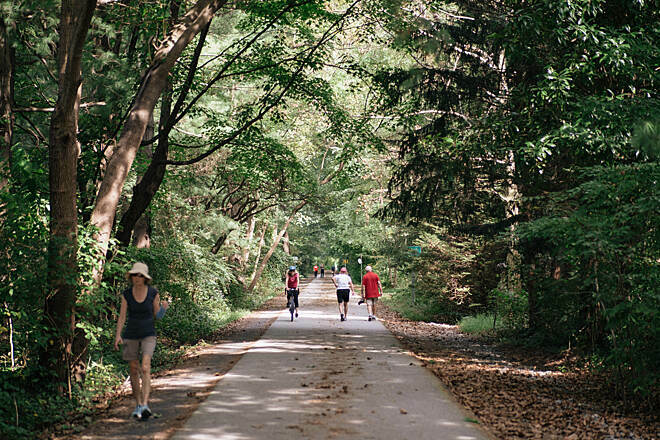 "You can access the trail near the 3.5 mile mark at a parking area next to a movie theatre and the Barnes Noble book store in downtown Bethesda, MD. 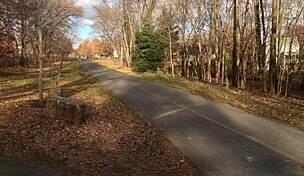 I did not know this was the Capital Crescent Trail but I saw the description and only walked a short distance as I was not down from Hagerstown for exercise. From what I saw, I really liked the signs telling people to stay to their right; however, any dirt and gravel off of the trail is a disaster if people are not listening to the rules, which they often are not. But the markings one does not see generally on many trails of staying to the right. 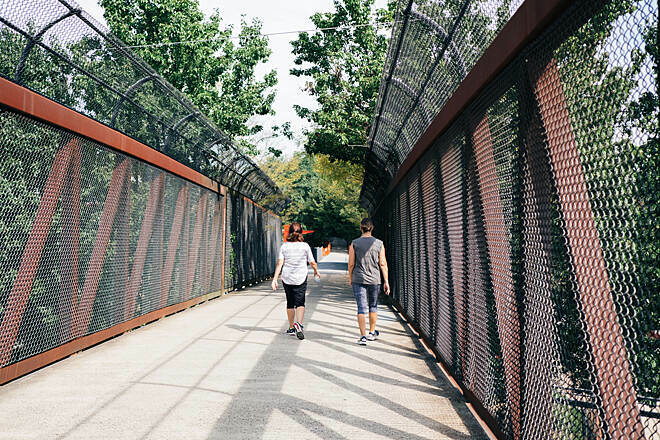 Many people are returning to Rails to Trails and the like at communities because walking events/races for walkers and runners are diminishing fast because of some lack of interest but mostly because of politics. I am a lifelong exerciser. I used to run but I cannot not do that anymore so I now walk or bike."